I almost hesitate to tell you what kind of vinaigrette because half of the earth will immediately be like EW GROSS NO X OUT. Because, folks, the utter magic of this dish comes from a heavy hand of fish sauce, which I’m perfectly aware freaks people out, even though I don’t pretend to understand why. I think most fear is really just fear of the unknown, though, so if you get to know fish sauce, you will love it and not be scared of it. Boom. 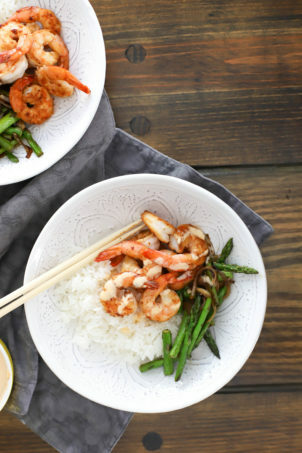 The fish sauce in this application alllmost acts like soy sauce, just a salty earthy umami flavor, not fishy at all, similar to Caesar dressing which gets its flavor from anchovy but doesn’t taste like fish either. 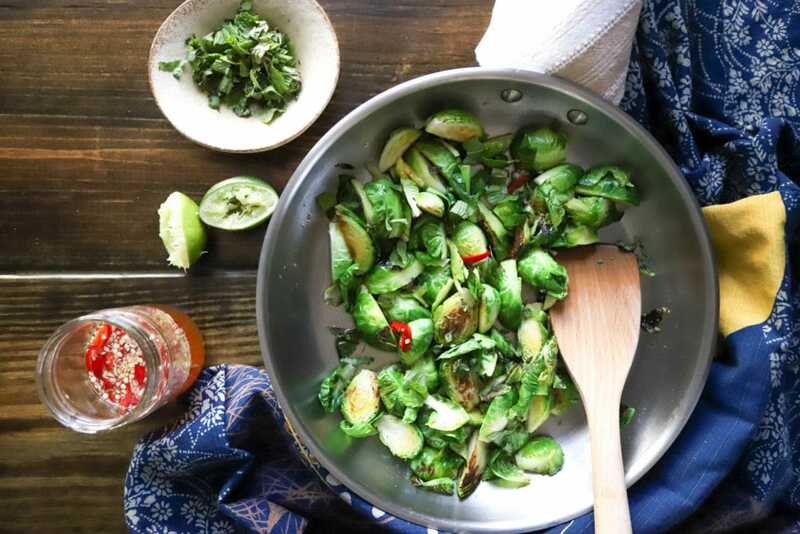 The dressing here also features garlic, hot peppers, and lime juice, and the huge punch of flavor with the stinky-in-a-good-way Brussels is absolutely wonderful. 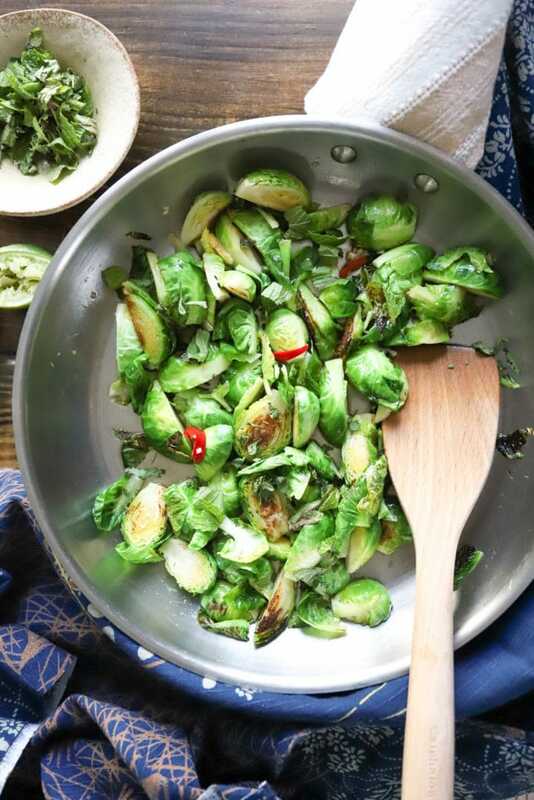 The Brussels sprouts, for their part, are cooked half in the skillet half in the oven, super quickly, to get some crispy edges + tender but not mushy insides. 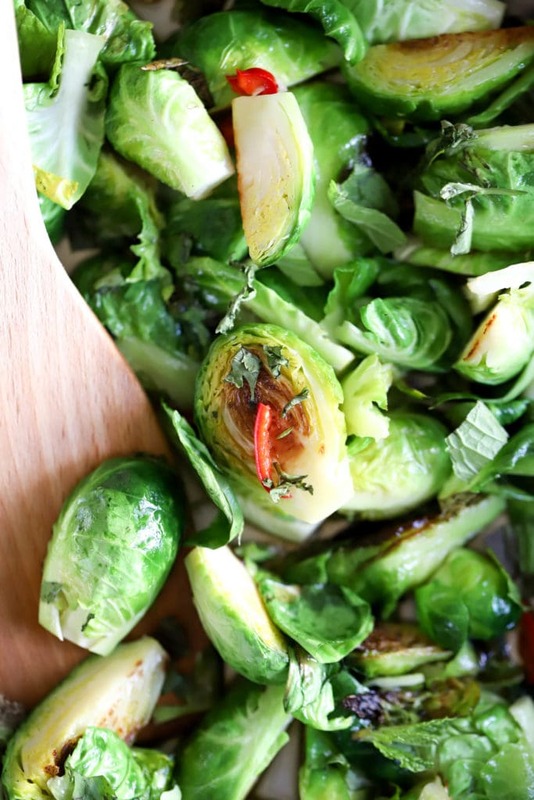 The sprouts get dark at the edges and bright green throughout, and tons of fresh herbs add to the brightness of the flavors. My friend Emily introduced me to this dish, and I’ve made it three times in as many months, which is a lot for us because we cook a bunch of different things AND like Brussels lots of different ways. The last time I made these I actually had leftover dressing and sprouts so the next day I shredded the Brussels on my mandoline and tossed them raw with some of the leftover dressing, and they were GOBBLED up. I may have liked them more than the cooked version of the recipe, I honestly can’t tell. The dressing recipe makes a ton, which I don’t mind at all because it keeps really well in the fridge and is so freaking good. 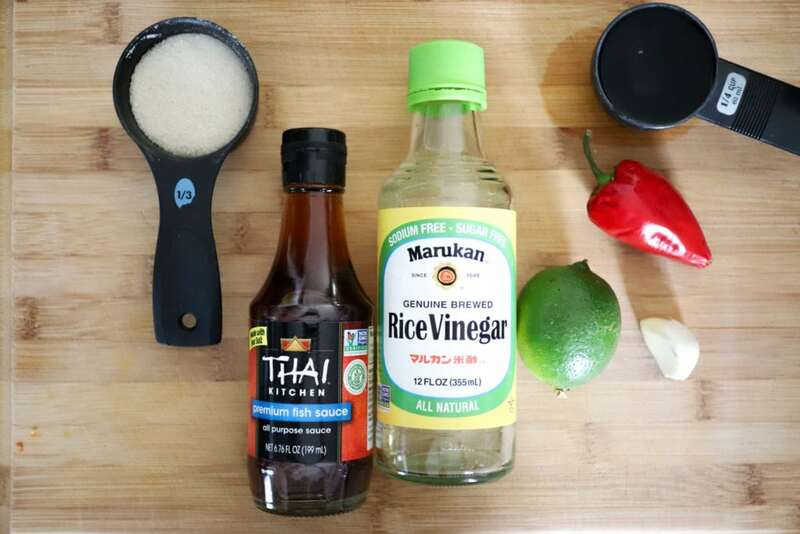 You need fish sauce, rice vinegar, lime juice, a garlic clove, hot red pepper, water, and sugar. For the dressing, thinly slice the red pepper and mince the garlic, then shake all of the ingredients in a jar together. Taste the dressing; add more fish sauce for salt or water to make the dressing a bit more mild. Next, prep the rest of the veggies. Trim the Brussels and halve or quarter them, and chop some cilantro and mint. The original Momofuku recipe (ps go to literally any of David Chang’s restaurants ever they are all so yummy) calls for finely chopped cilantro stems and whole leaves, which I love. 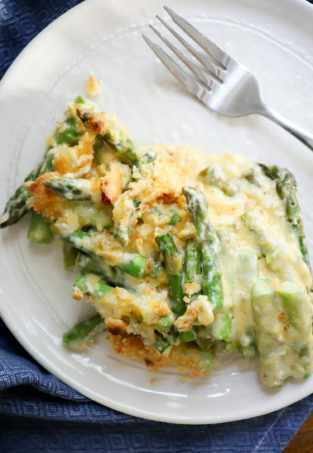 As a note, I use this recipe as a guide but only make one pound of Brussels at a time, which I find is perfect for 4 servings with a regular meal or 2 servings for a lighter meal where we’re having these with just rice or just fish, but not both. To pan roast, preheat the oven to 400F and a skillet on the stovetop (stainless steel if you have one, or cast iron) with a drizzle of oil. 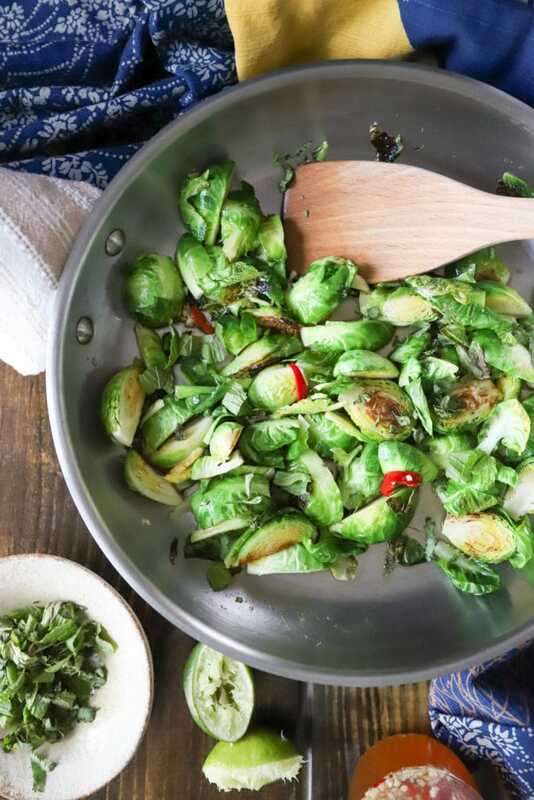 When the oven and skillet are hot, add the sprouts in one layer and let them cook for about 5 minutes without touching them until the sprouts begin to brown. Then, shake the skillet to toss the Brussels one time and transfer the entire skillet to the oven. 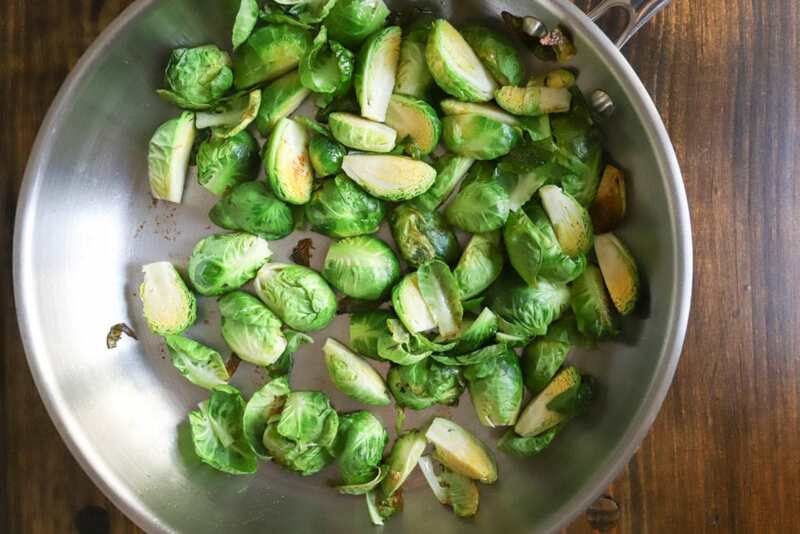 Cook the sprouts for 10-15 minutes in the oven until they are bright green and tender but not mushy – I usually go more 10 minutes, but check them and decide based on how large your veggies are and how hot your skillet was on the stovetop. At this point, the sprouts have no seasoning at all but are cooked and ready to go. While the pan is still super hot from the oven, add the cilantro stems and a few tablespoons of the dressing. 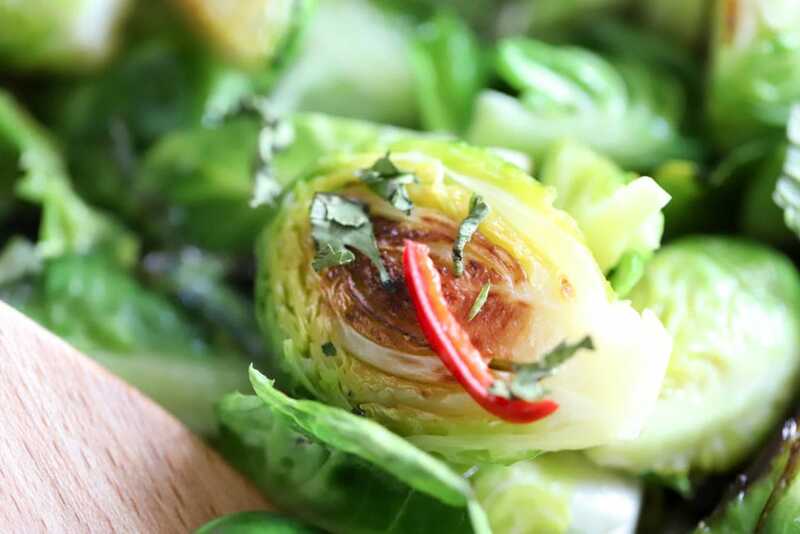 Taste a sprout, and add more dressing to your preference/based on how much is absorbed by the Brussels and the hot pan. 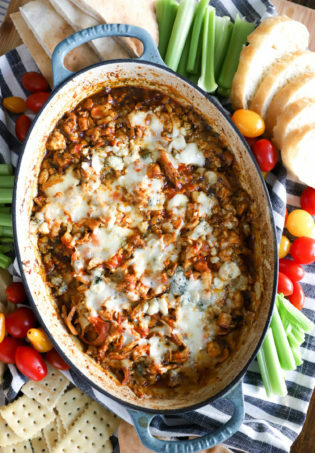 Sprinkle the mint and cilantro leaves all over the dish, toss one more time, and serve! The most time consuming part of this is the prep, which can all be done in advance. Then, the cooking/seasoning takes 20 minutes or so, and the side dish of my literal dreams is born. Thanks to Emily for this fabulous recommendation (it was her birthday yesterday! 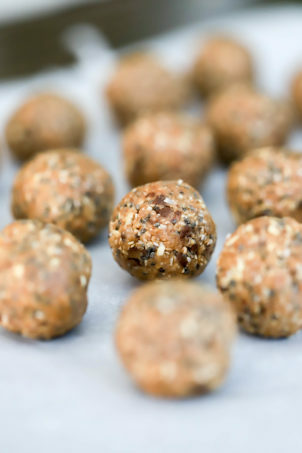 ), and PLEASE try these soon! 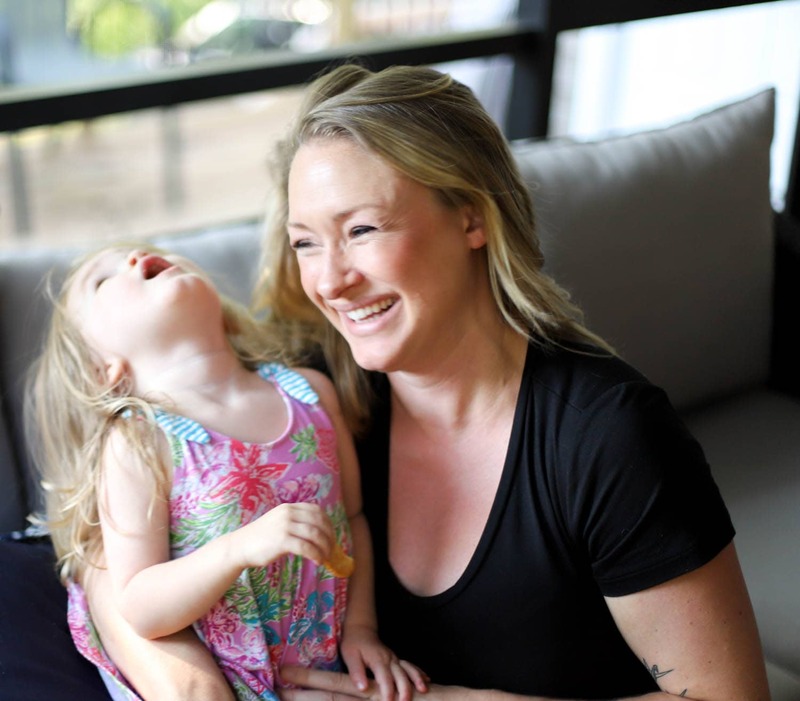 They are the most wonderful addition to meals year-round, I just can’t say enough good things about them. Also. Do not be afraid of the fish sauce. Embrace the fish sauce. Enjoy these! They are SO yummy and different-tasting in the best possible way. Preheat the oven to 400F. 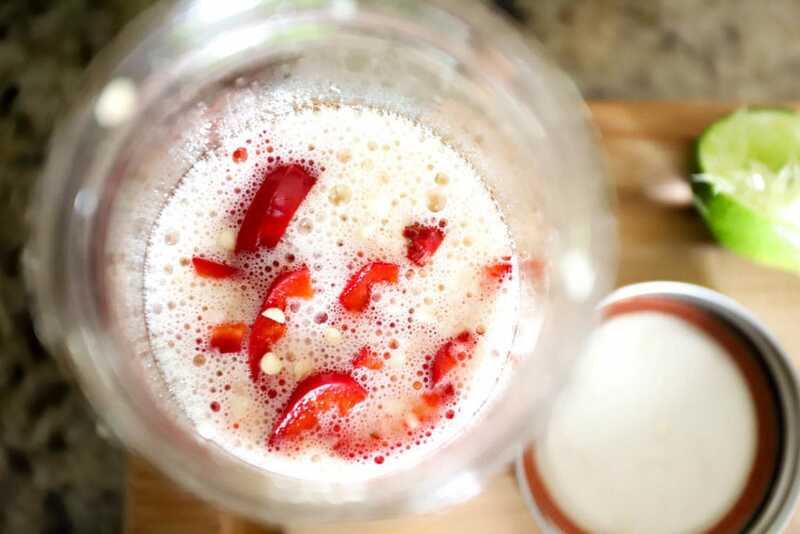 Make the vinaigrette by shaking all of the ingredients together in a jar until combined and the sugar has dissolved. Taste, and add more fish sauce, vinegar, or sugar to your preference. Preheat a large ovenproof skillet to medium-high heat with the olive oil. 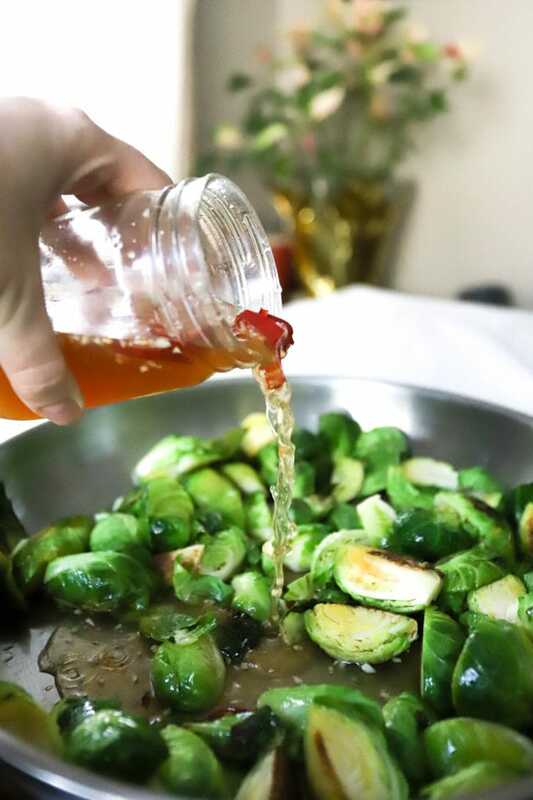 When the oil is hot, add the Brussels in one layer and let them cook undisturbed for about 5 minutes until they start to brown on the bottom. Shake the pan once to toss the sprouts, then transfer the entire skillet to the oven. Roast the Brussels for 10-15 minutes until tender but not mushy. While the pan is still very hot, add the cilantro stems and a few tablespoons of the dressing to the skillet. Stir to combine, and taste; add more fish sauce vinaigrette to your preference. 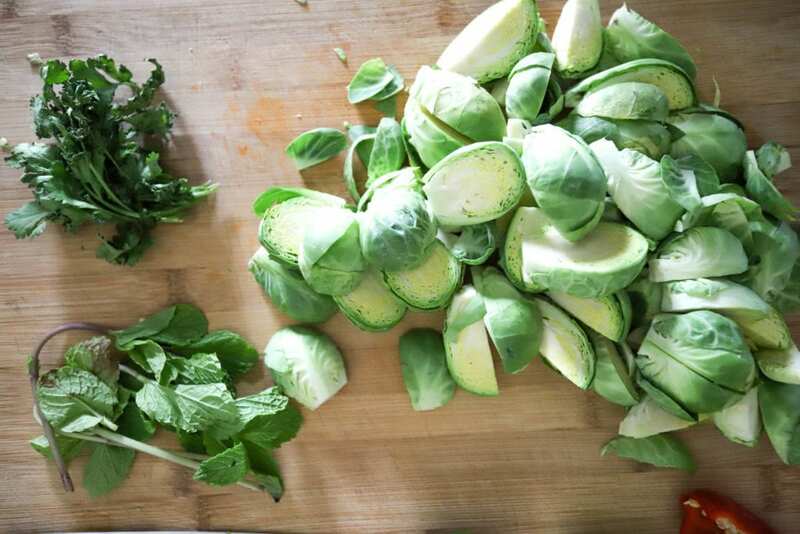 Toss the mint and cilantro leaves with the Brussels sprouts and serve immediately. Enjoy!